In deep 3-quart salad bowl, place half of the lettuce. 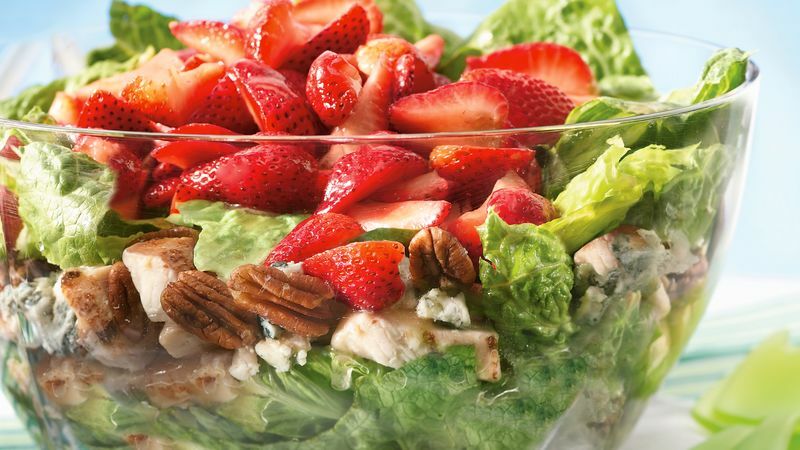 Layer with chicken, cheese, pecan halves, remaining lettuce and strawberries. In small bowl or glass measuring cup, mix dressing ingredients with wire whisk until well blended. Just before serving, pour dressing over salad. Do-Ahead: Make the salad and the dressing ahead. Cover each with plastic wrap and refrigerate up to 4 hours before serving. Time Saver: Purchase a bottle of red wine vinaigrette dressing and use for the homemade dressing.